Their 4th album Autobahn was released late in 1974 and saw them achieve success in the USA, where the album hit the top 10, and also around Europe. With financial support from their American record company, they were able to tour internationally, spending most of 1975 touring, playing dates in the USA, Canada and Europe. 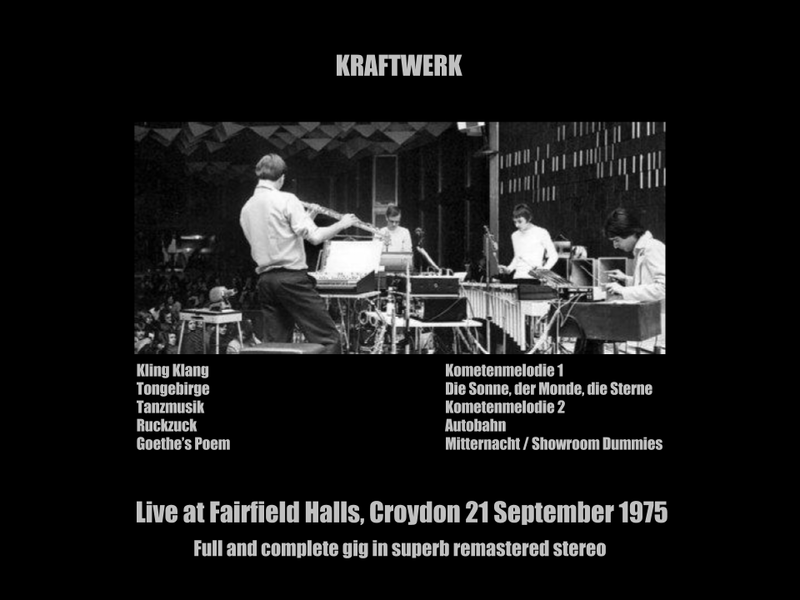 For the first time, Kraftwerk featured Wolfgang Flur and the newly recruited Karl Bartos, alongside Ralf Hutter and Florian Schneider; so this tour featured what is often referred to as the "classic lineup", which lasted for 12 years until 1987 when Flur left. September 1975 saw Kraftwerk playing a number of dates around the UK, including this one. There are a couple of versions of this gig available - the most common one features Autobahn cut short, and at the very end of the set as the encore. I found another inferior sounding recording which purports to be of the same gig with Autobahn complete but with the left and right channels reversed - and Autobahn not as the encore, but as the last track of the main set - the encore being Mitternacht (which really seems to be an extended jam turning into an early Showroom Dummies at one point). I've looked around the internet and taken the view that the more common bootleg has the tracks wrong - and that Autobahn shouldn't be the last track. So I was able to take the full Autobahn from the inferior recording, fix the sound and the channels, and transplant it into the recording I was already working on - in short, fix it to match the rest of the tracks and present you with the whole gig, repaired and remastered in full stereo.I left the vinyl noise where it appears as its only in parts of the recording and I don't think it's that loud that it spoils anything. many thanks for this one, much appreciated.